Dog-friendly cabin with private hot tub, fenced yard, and gorgeous location! Escape your everyday worries with this home in breathtaking Blue Ridge, Georgia! You, your loved ones, and your dogs will all enjoy the fresh air, as well as perks like a private hot tub. 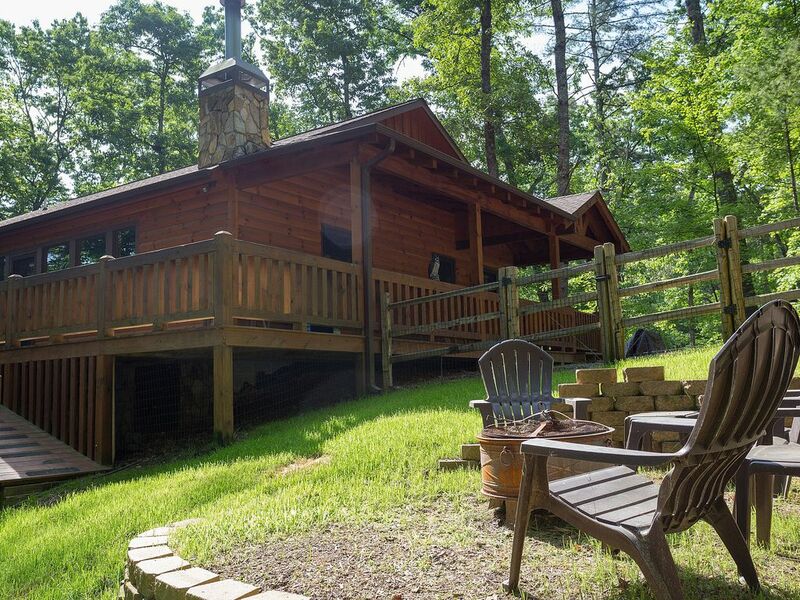 Nestled south of Lake Blue Ridge, this cabin provides easy access to the Aska Adventure Area. You can explore northern Georgia's gorgeous forests thanks to nearby hiking trails. snap photos of some unforgettable waterfalls. You can even see why Blue Ridge is famed as the trout capital of Georgia with a day of fishing. Back at the rental, breathe in some fresh air outside as your dogs run around - up to four can accompany you for a small nightly fee. The private hot tub will soothe your weary muscles, while the seasonal wood-burning fireplace will warm you up back inside. Use the free WiFi and cable on the flatscreen TV to stay entertained, or step out on the deck to enjoy some fresh air. When you're ready for some delicious home cooking, the grill and fully equipped kitchen have everything you need to whip up something tasty! Why wait for the perfect Georgia getaway? Secure it now and save your dates today! Parking Notes: Park at the top of the driveway if there is ice. The cabin is so well thought out! It’s stocked with everything you can imagine and very pet friendly!! Our dogs LOVED the ramp from the porch down to the spacious fenced yard. The beds were super comfortable and the hot tub was AMAZING!!! We didn’t leave once we checked in and thoroughly enjoyed cooking in the kitchen which was stocked with every utensil and appliance you could need!! There’s also a game and movie library with something for everyone. Our dogs had so much fun they’re kinda depressed now that we’re back home on our farm....so we’ve promised to take them back! They enjoyed it as much as we did. This place deserves 10 stars! If you’re lucky that it’s available on the days you’re wanting to go then don’t waste a second and book it!! Very clean and organized. Everything we needed was there. Amazing experience, loved everything about it! Everything you need was already there for us. Secluded, quiet, perfect. Wonderful to stay at such a dog welcoming cabin. Lots of wonderful spring hiking available near by. Relaxing stay in the mountains. We enjoyed our stay in this peaceful cabin. As noted in prior reviews it has everything you need for your stay. Easy access to the yard for the dog. Barbara, the property manager, was very attentive when we needed to contact her and insured our stay was relaxing and enjoyable. The property is situated in a beautiful section of the Aska Adventure area, 15 minutes from town, and close to the beautiful Toccoa River. Thank you for sharing your cabin with us. We enjoyed our stay at the cabin in the woods. It was easy access for the dog to enjoy the yard and the Hot Tub was nice to relax in. Barbara, the property manager, was attentive to or needs when we reached out to her and wanted to insure our stay was a good one. The cabin is 15 minutes from town and located close to the Toccoa River and Aska Advenutre area.